My creative escapades flow into the area of parenthood and by extension grandparenthood. While mine is not a "mommy blog" some of my ideas and designs would qualify. This is one. Today is Valentine's Day and I sent a ribbon of hearts to my first grandchild, Taylor. He is just shy of two and at that stage of understanding, and loving to follow directions. It won't last long. 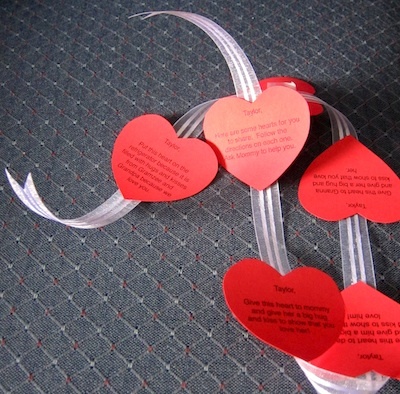 Each heart, attached to the ribbon by removable tape, includes a direction to follow: "Bring this heart to Mommy and give her a hug and kisses." There are hearts on the ribbon for all the important people in his life that he sees regularly. It is a simple, creative way to stay connected over the miles to a grandchild that lives just too far away.